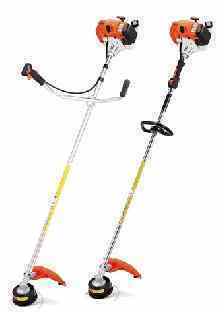 WASHINGTON, Oct. 20, 1999 -- Stihl Inc., of Virginia Beach, Va., is voluntarily recalling about 7,200 weed trimmers, 192 brushcutters and 344 augers. The devices have an unsealed seam in the fuel tank that could cause a fire. Stihl is aware of one incident in Europe of a fuel leak from a trimmer. No injuries were reported. The trimmers, sold with both loop- and bicycle-type handles, have model numbers FS 120 and FS 200. The brushcutters, with bicycle-type handles, have model number FS 350. The augers have model number BT 120C, and are used to drill holes in the ground. The model numbers are located on the top of the engines' shrouds. The serial number is stamped into the crank case base, and can be seen by turning the unit upside down and looking at the metal plate on the muffler side between the fuel tank and muffler shroud. The model number and the word "Stihl" is written on the products. Stihl dealers sold these trimmers, brushcutters and augers from November 1998 through September 1999 for between $400 and $700, depending on the model purchased. WHAT TO DO: Stop using these products immediately, and call Stihl to determine if your trimmer, brushcutter or auger is part of this recall. If so, consumers should return it to an authorized Stihl dealer for a free replacement fuel tank. For more information, call Stihl at (800) 467-8445 between 7 a.m. and 2 a.m. ET Monday through Friday, and between 8 a.m. and 12 a.m. ET Saturday and Sunday. Consumers also can get more information on Stihl's web site at www.stihlusa.com. WASHINGTON, Oct. 18, 1999 -- Citing at least 50 fires, General Electric is voluntarily recalling about 3.1 million GE and Hotpoint brand dishwashers, manufactured between April 1983 and January 1989. Some consumers are unhappy with the terms of the recall, however, and question whether it would not be more properly called a rebate program. The dishwashers have a slide switch that allows consumers to choose between heat drying and energy saver functions. Over time, the slide switch can melt and ignite, presenting a fire hazard. GE and the Consumer Product Safety Commission (CPSC) said they have reports of 50 fires, seven of which spread beyond the dishwashers. In three cases, the structure of the house or apartment was damaged. No injuries have been reported. The GE and Hotpoint dishwashers that are being recalled are model GSD500D, GSD500G, GSD540, HDA467, HDA477 or HDA487 with a serial number that has a second letter of A, M, R, S, T, V or Z (for example, BM12345). The model and serial numbers are located on a rectangular label that is on either the right or left front edge of the inner tub. The GE or Hotpoint brand name is on the front of the dishwasher. Consumers should stop using the recalled dishwashers immediately. Keep the dishwasher door unlatched to prevent the flow of electric current from the latch to the slide switch. GE is offering consumers a rebate toward the purchase of a new dishwasher. Contact GE at (800) 599-2929 anytime or www.geappliancerecall.com for information on how to participate in the rebate program. WASHINGTON, D.C., Oct. 13, 1999 -- In cooperation with the U.S. Consumer Product Safety Commission (CPSC), York International Corp., of York, Pa., is recalling about 21,000 York International Corporation Diamond 80 downflow mid- efficiency furnaces with model numbers starting with P2DP, PBKD, and XED02. Because of inadequate gluing, the insulation surrounding the heat exchanger can separate from the cabinet wall of the furnace, and fall onto the heat exchanger. This could cause surrounding combustible material and drywall to catch on fire, which has the potential to cause burn injuries and deaths. York began this recall in late 1997. However, only about 9,000 of the recalled furnaces have been repaired to date. York International and CPSC are aware of 11 incidents involving this furnace, including five fires causing $74,000 in property damage. York and CPSC wish to reinforce the seriousness of the situation and continue efforts to promote increased participation. York is offering its distributors a $25 bounty for each furnace they locate. These furnaces were sold under the brand names York, Fraser- Johnston, Luxaire and Moncrief. The furnaces were sold with the model numbers P2DP, PBKD and XEDO2, and with serial number beginning with EECM or EGEM. The model number and serial number can be found on a label inside the furnace cabinet. York dealers sold these furnaces nationwide from May 1994 through July 1996 for about $680. Consumers should contact their local York dealer immediately to schedule a free repair visit. For more information, consumers should call York International/UPG Technical Services toll-free at (877) 874- 7378 between 8 a.m and 5 p.m. EDT Monday through Friday, or visit the York web site at www.york.com/upgsafe/safety.htm. WASHINGTON, Oct. 13, 1999 -- In cooperation with the U.S. Consumer Product Safety Commission (CPSC), Shine International Trading Co. Inc., of Flushing, N.Y., is recalling about 2.4 million cigarette lighters. The lighters' child-resistant mechanisms fail to meet the requirements of the Consumer Product Safety Act. Young children could ignite the lighters, presenting fire and burn hazards. Additionally, the lighters can leak fuel and remain on after consumers have used them, which also presents fire and burn hazards. CPSC and Shine International Trading Co. Inc. have received three incident reports with these lighters. One incident involved two lighters that continued to burn after the consumer put them down, one involved two lighters that spontaneously blew apart while unattended, and one involved a lighter that burst into flames resulting in minor property damage. No injuries have been reported. The lighters being recalled are non-refillable, oval-tube-shaped, with a transparent solid-colored (red, green, yellow, orange or purple) plastic body and a metal top. The lighters measure about 3.25 inches high and 1 inch wide. "SHINE" is imprinted into the metal top of the lighter. There is a warning label on the lighter. "SHINE" and "MADE IN CHINA" are written on the label. The lighters operate with a roll and press type of ignition mechanism to produce a flame. Small stores and souvenir shops nationwide sold these lighters from August 1998 through July 1999 for about $1. Consumers should stop using these lighters immediately and return them to the store where purchased for a full refund. For more information, call Shine International Trading Co., Inc. toll-free at (888) 491-6676 between 9 a.m. and 5 p.m. EDT Monday through Friday. U.S. Customs alerted CPSC to this product hazard. WASHINGTON, Oct. 8, 1999 -- Gateway is voluntarily recalling about 1 million foam rubber toy cows that were given to computer purchasers for use as stress relievers. Small pieces of these foam rubber cows can tear away, posing a serious choking hazard to young children. Gateway and the U.S. Consumer Product Safety Commission said there had been three reports of pieces of the cows tearing away but no reports of injury. The cows are white with black spots. They are about 4.5 inches long and 3 inches high. "Gateway" is written in green on the cows' backs. Gateway stores distributed the cows from September 1997 through September 1999 as a give-away with a computer purchase. A small number were sold separately for about $4. Consumers should either throw these cows away immediately or take them to any Gateway Country store location for exchange for another Gateway-brand item of comparable value. For more information, call Gateway toll-free at (877) 206-4889 anytime or go to the recall web site at www.gateway.com/stresscow.